Call it the soccerization of cricket or a repackaging that worked: Twenty20 has emerged as an instance of product marketing gone right. First, of course, it is to the International Cricket Council’s (ICC) credit that it spotted the need to check the slipping demand for the gentleman’s game. It repackaged international cricket, a popular product across geographies, and came up with a new version that was an instant hit among its target consumers—viewers and advertisers alike. With its aggressive pitching and pricing, ICC was able to give cricket a new sales push. The success of a mass entertainment product is measured in terms of the eyeballs and advertising revenues it garners. The all-new T20 exceeded expectations on both fronts. Television ratings created history during the final India-Pakistan match on 24 September as TVRs (television rating points, or the percentage of viewers watching the show) touched 25; the highest TVR that Kaun Banega Crorepati-II, a game show hosted by Bollywood star Shah Rukh Khan, got was 19. Similarly, the semi-final between India and Australia touched a TVR of 23.2. The combined channel share of ESPN and Star Cricket, the two channels broadcasting the matches, was an impressive 63%. Even the share of female viewers, a non-core segment for cricket, was 12.8%. According to TAM Media Research, a Mumbai-based television audience measurement agency, the semi-final match was the highest rated programme across the top three Hindi mass channels in the current year so far. Evidently, T20 is a huge draw. And, it is not just because Indian fortunes have revived, although the story may have been different had India not progressed to the final and won it. Still, even non-India matches got a huge response. The opening match between hosts South Africa and West Indies, for instance, managed a TVR of 5.8. The instant connect that T20 struck with its target group enthused advertisers, who were more than ready to pay a premium for T20 spots. According to media buyers, advertisers were ready to pay Rs2-2.5 lakh for a 10-seconder during a T20 match, almost double the ODI World Cup rate of Rs1-1.5 lakh earlier this year. The last-minute inventory for the final touched an unheard level of Rs6-8 lakh per 10 seconds. T20 certainly scores well on parameters of product innovation, packaging, pitching and pricing. The biggest gainer from this successful gambit is its owner, ICC, and its broadcaster, ESPN-Star Sports. Unconfirmed reports peg ESPN’s earnings from the event at $200 million (about Rs800 crore). ICC’s sponsorship consultant Jamie Stewart, who was associated with selling the 18 ICC events between 2007 and 2015, refuses to disclose what the sport’s apex body earned, but says that T20 was a “huge success, financially". Stewart says the fact that even non-India matches drew high TVRs—“higher than an average NatWest match"—attests to T20’s success. Noting that the event was an “entry point" for new sponsors (such as Reliance Communications Ltd), Stewart says T20 has managed to draw new viewers to the game. “Maybe, now they will go up the value chain to the 50-over format, and then to Tests." Marketing experts, too, have adjudged T20 to be a hit. Not just as an advertisement vehicle, but as a case of marketing makeover. “It is a classic example of sports revival. The championship takes a look at the contemporary need of the contemporary viewer, where the majority is young," says Harish Bijoor, CEO, Harish Bijoor Consults. “The product (in this case) is the brand which, if marketed successfully, will catch the attention of the viewers, " he added. Sunder Raman, managing director, MindShare, agrees: “T20 has given a new lease of life to cricket, and its advertisers." The first One-Day International (ODI) was played in 1971 when rain washed out the first three days of a Test match between Australia and England in Melbourne. By the time Australian media entrepreneur Kerry Packer created the World Series Cricket championship (this introduced many of today’s staples in ODIs, including the white ball and multi-coloured uniforms), the shorter format was beginning to become more popular and attract more audiences than the longer one. But even a day-long game is too long by today’s standards. A game of football lasts around two hours, including the half-time break. Most basketball games last under an hour. Baseball games last around three hours at most. And a game of American football lasts a little over an hour. The T20 is a step further down the consumer-friendly road. “ICC realized that cricket would not continue to have a very long life globally if it takes too much time of the viewer," says Sunder Raman, managing director, MindShare, a media buying agency. With 20 overs to each side, a game takes about three hours. There is no scope for a tie as the T20 format provides for a five-ball bowl-out, quite similar to a penalty shootout in football. A three-hour game can be synchronized with prime-time telecast on television, or people can catch the game live after a day at work. Conceived in 2003 by the England and Wales Cricket Board, the first T20 match at Lord’s on 15 July 2004, between Middlesex and Surrey, attracted a crowd of 26,500— the largest attendance for any county game, other than a one-day final, since 1953. The high viewership ratings for the inaugural T20 World Cup show that the product fixes have worked. Ratings for the first T20 India-Pakistan clash on 14 September on sports channels ESPN and Star Cricket peaked to a record TVR of 15.2—more than double an average one-dayer. Test cricket is considered a purist’s delight. ODIs have always been considered the more popular version of the game. But it is T20 that has really taken the game to the masses. Tournament organizer ICC seems to have got things right by approaching the event not just as a sporting tournament, but an entertainment show. The colour and the glitz generally associated with the rough and tumble of football, the fireworks, the cheerleaders and the shiny tracksuits, were a hit with the crowd. The choice of venue was also apt: South Africa, where the T20 format isn’t exactly new and unfamiliar to audiences. “A whole new generation, which has gradually started moving to online and mobile gaming, was drawn to the format," says ICC’s sponsorship consultant Jamie Stewart. “It’s a lot easier for people to watch cricket." The numbers bear testimony to the format’s ability to attract people who wouldn’t otherwise be interested in cricket: Statistics released by media tracker TAM show women viewers accounted for a TVR of 12.3 during the India-Australia semi-final , higher than the TVR of 12 for men during the first India-Pakistan match on 14 September. T20 has taken cricket to an even wider audience than ODIs, particularly the young. Not surprisingly, it has managed to attract advertisers that have thus far shunned cricket. Havells, an electrical goods brand, chose the T20 to make its debut in cricket advertising. ICC says it never pitched the T20 event to sponsors. “There was no separate pitching for the ICC T20 Cup," says its spokesperson, Brian Murgatroyd. But, what worked was pitching the format to the audience. Murgatroyd ascribes part of the success of T20 to the popularity of cricket itself. “Cricket has always been popular; it is the second most popular game in the world after football, and is played by all the four sub-continent countries, which account for one-fifth of the world’s population," he says . And, of course, the T20 format “has been popular wherever it’s played". Advertisers certainly take the new format seriously. Says Sanjay Behl, head of branding at Reliance Communications Ltd , which had the Reliance Mobile logo emblazoned on outfits of cheerleaders: “There’s huge rub-off happening with the new format. It fits with our brand." T20, like smaller format sports such as Formula One racing and football, is a hit with advertisers. So much so, Stewart says: “I foresee the T20 replacing the (one-day) ICC Championship Trophy in a few years." The shorter format, however, means a smaller advertising inventory. A seven-hour ODI has some 140-150 ad spots of 30 seconds each, adding up to 4,500 seconds, while a three-hour T20 match has some 50-56 ad spots of 30 seconds each, about 1,500 seconds. But, the fewer ad slots are more likely to be effective, as the action-packed format ensures a far more committed viewer. Also, unlike in the previous World Cup, inventory was not sold in bulk packages, allowing advertisers to choose the slot and the price. Even as the broadcasters struggled to cram in 50-odd ad breaks into three hours, advertisers scrambled to book the slots; and when the format’s popularity became evident, they were more than ready to pay a premium. 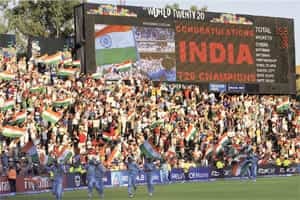 According to MindShare, a 10-second ad spot on ESPN Star Sports sold for Rs2.5 lakh during the course of the championship and peaked to Rs6-8 lakh for the final match between India and Pakistan. “This was about 40% higher than the ICC World Cup 2007, where a 10-second spot was selling for about ₹ 1-1.5 lakh," says MindShare’s Raman. After the ICC World Cup debacle (India’s early exit hit advertisers and the broadcaster, Sony Entertainment Television), ESPN had come up with a unique offer for media buyers. It promised compensation in the event of low viewership. “Our contracts said that if the matches were not able to generate expected TVRs, the broadcaster will compensate us for the downfall and vice-versa. So, there was an assurance in the mind of media buyers that our investment will not go bad," said Ajit Verghese, managing director, Maxus India, a media buying agency. The T20 World Cup also gave non-traditional brands an opportunity to enter the cricket advertising market at much lower costs as the meltdown had levelled sponsorship rates. Among the bigger advertisers for the T20 event at Johannesburg were Reliance Mobile, Havells, Nokia, Pepsi and Hero Honda.